A study led by UCLA scientists has found that smaller silver nanoparticles entered fish’s bodies more deeply and persisted longer than larger silver nanoparticles or fluid silver nitrate. More than 2,000 consumer products today contain nanoparticles — particles so small that they are measured in billionths of a meter. Manufacturers use nanoparticles to help sunscreen work better against the sun’s rays and to make athletic apparel better at wicking moisture away from the body, among many other purposes. Of those products, 462 contain nanoparticles made from silver, which are used for their ability to kill bacteria. But that benefit might be coming at a cost to the environment. In many cases, simply using the products as-intended causes silver nanoparticles to wind up in rivers and other bodies of water, where they can be ingested by fish and interact with other marine life. The new study by the University of California Center for Environmental Implications of Nanotechnology, published online in the journal ACS Nano, was intend to begin addressing the question: to what extent do organisms retain those particles and what effects might they have? According to Andre Nel, director of UCLA’s Center for Environmental Implications of Nanotechnology (CEIN) and associate director of the California NanoSystems Institute at UCLA, it is not yet known whether silver nanoparticles are harmful, but the research team wanted to first identify whether they were even being absorbed by fish. In the study, researchers placed zebrafish in water that contained fluid silver nitrate and two sizes of silver nanoparticles — some measuring 20 nanometers in diameter and others 110 nanometers. The researchers found that the two sizes of particles affected the fish very differently. 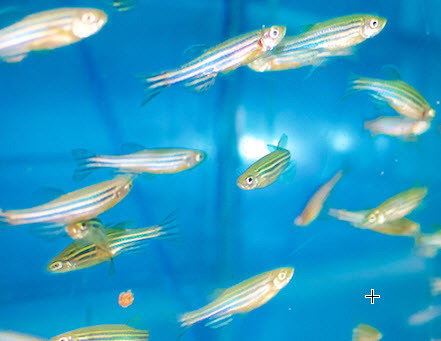 The researchers used zebrafish in the study because they have some genetic similarities to humans, and their embryos and larvae are transparent (which makes them easier to observe). In addition, they tend to absorb chemicals and other substances from water. The team focused its research on the fish’s gills and intestines because they are the organs most susceptible to silver exposure. The gills showed a significantly higher silver content for the 20-nanometer than the 110-nanometer particles, while the values were more similar in the intestines; both sizes of the silver particles were retained in the intestines even after the fish spent seven days in clean water. The experiment was one of the most comprehensive in vivo studies to date on silver nanoparticles, as well as the first to compare silver nanoparticle toxicity by extent of organ penetration and duration with different-sized particles, and the first to demonstrate a mechanism for the differences. Osborne said the results seem to indicate that smaller particles penetrated deeper into the fishes’ organs and stayed there longer because they dissolve faster than the larger particles and are more readily absorbed by the fish. Nel said the team’s next step is to determine whether silver particles are potentially harmful. “Our research will continue in earnest to determine what the long-term effects of this exposure can be,” he said. The research was supported by the National Science Foundation and the Environmental Protection Agency. We studied adult zebrafish to determine whether the size of 20 and 110 nm citrate-coated silver nanoparticles (AgC NPs) differentially impact the gills and intestines, known target organs for Ag toxicity in fish. Following exposure for 4 h, 4 days, or 4 days plus a 7 day depuration period, we obtained different toxicokinetic profiles for different particle sizes, as determined by Ag content of the tissues. Ionic AgNO3 served as a positive control. The gills showed a significantly higher Ag content for the 20 nm particles at 4 h and 4 days than the 110 nm particles, while the values were more similar in the intestines. Both particle types were retained in the intestines even after depuration. These toxicokinetics were accompanied by striking size-dependent differences in the ultrastructural features and histopathology in the target organs in response to the particulates. 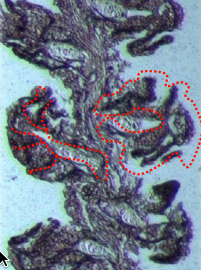 Ag staining of the gills and intestines confirmed prominent Ag deposition in the basolateral membranes for the 20 nm but not for the 110 nm particles. Furthermore, it was possible to link the site of tissue deposition to disruption of the Na+/K+ ion channel, which is also localized to the basolateral membrane. This was confirmed by a reduction in ATPase activity and immunohistochemical detection of the α subunit of this channel in both target organs, with the 20 nm particles causing significantly higher inhibition and disruption than the larger size particles or AgNO3. These results demonstrate the importance of particle size in determining the hazardous impact of AgNPs in the gills and intestines of adult zebrafish.